The Clockwork Apostles are devout followers of the Clockwork God, Sotha Sil. 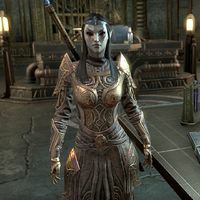 They reside in the Clockwork Basilica within the Brass Fortress of the Clockwork City. Apostles are often seen as elitist by non-apostles, and they are known send others to perform menial tasks for them. They follow the Sermons of Sotha Sil and devote their work towards one goal: achieving Tamriel Final, a new Nirn. Apostle's legal system is relatively rudimentary, mostly because it is used so rarely. Infractions, such as research sabotage or plagiarism, typically result in exile. For more serious crimes, Apostles use a method of punishment known as a cognitive prison — an induced coma where the condemned's mind is set to a recursive loop, trapping them in an inescapable mental space. By the mid-Second Era, the punishment had only been used twelve times. This page was last modified on 27 November 2018, at 23:38.